Joseverson over on www.judoforum.com has just posted another great article, as always. 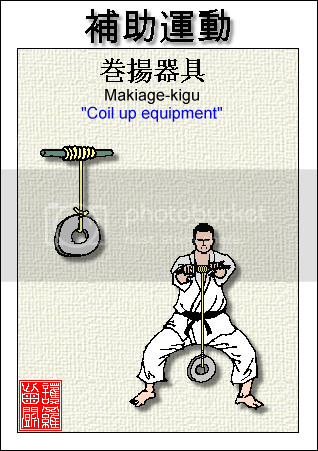 This, Makiage-kigu looks like a classic old Judo training technique, which is useful to develop grip strength stamina. For those of you who are not familiar with the blog by Joseverson, you really should spend some time browsing it. The blog is basically about Japanese language but the words are really good to know for Judoka and the images are fantastic also. One question for Joseverson though, what would you classify Running/Jogging when done in a supplementary training context? Here is a quick update to what is happening over on www.planetjudo.com I would appreciate your feedback on recent additions. PlanetJudo now has 50 feeds, from the USA, Europe and even New Zealand. Recent additions are the BBC's Judo news site, Fickr photos tagged Judo and finally YouTube Judo videos. I would be interested in your opinion as to how good it is to have these in the feed. Flickr and Youtube are the busiest feeds and dominate the site, do they dominate too much? Also, there are quite a few photos and videos that make it into the feed from them that are not really Judo related I notice. Are they a plus or a minus? The BBC feed is a new find and one that will only get busier this year with Beijing in the summer. I am still looking for more feeds, so please let me know if you find some I don't have. Soon I may be able to add more from www.JudoForum.com as there has been a discussion there about turning on the RSS feeds. If you have not already, please visit the site ( www.planetjudo.com ) and subscribe to the "feed" ( http://feeds.feedburner.com/PlanetJudo ) so you can get the updates direct to your feedreader, browser or even by email. There is also a "HISTORY" page at http://www.planetjudo.com/?type=cheese which is worth looking at as it summarises everything that the feed has had on it by day. As always, email me lw <at> judocoach.com with any updates, comments, etc. World Judo Masters 2008 Training - Week 30/48. As you may have picked up from my earlier posts, this week was not a good one training-wise. I was a slack bugga really. To be fair, I did manage to hit my running targets for the week, 10.65 miles, in fact I exceeded it hitting 11.78 miles. This was made up mainly by a 7.88 mile run on Saturday morning, which I really enjoyed and found quite comfortable. Which is a pleasant state to be in at this point. My mileage targets keep going up for the next seven weeks, so I am pretty pleased that I am running comfortably, no pains of note. This week I have been trying to finalize the plans for the trip and get such things as confirmations that everyone is onboard. I also organized for my club coach in New Zealand to re-register me there which is part of the plan, I have also been trying to ensure the rest of the team are registered in NZ. Next step is to book flights, hotels, etc. Which will hurt as I'll be paying the bills up front and hoping to cover the costs. Once everything is booked, the work starts in earnest to try and fund this little operation. If you are reading this on the site ( www.judocoach.com/blog ) you'll notice the new "dropcash" campaign widget on the righthand side. It is basically a donation engine, people can pay via their PayPal accounts (or credit cards) and the total donations get added together. If you are feeling generous, please consider clicking on the "donate now >>" link. You can probably see that the budget I have set is pretty large five thousand pounds/$10,000 (USD). This includes all the flights accommodation, food, taxis, and other items. I am hoping to make the trip really memorable for all involved and also provide an opportunity to promote our sponsors to be and Judo in general. I found the video below this morning, it features a lady I have had the great privilege to met and speak with, Jane Bridge, World Champion. Jane, is/was coaching a professional/semi-professional Judo team in France, although I think she is now in the UK working at Team Bath. Anyway, this is how I wish I did my Seoi Nage! I found this video on this site http://stagejudo.com/jukebox.aspx anyone able to tell me more about the site> Also curious if I can get a copy of the DVD(s) that seem to be available... maybe. You may also be interested in listening to Jane Speak in a keynote lecture at the University of Bath with fellow World Champion Daniel Lascau. It is split into two MP3 files over at www.thejudopodcast.eu (PART1, PART2). So this week I have missed all my Judo sessions. Partly this is work related with me getting in home, but partly it's me having not tried hard enough to get to training. Those of you have been following this blog for a while might have noticed I have done this before. It seems every four weeks or so, I "fall off the wagon", and my training dies for about a week. In terms of coaching, you can expect this to happen with anyone you are coaching. Maybe not with the frequency I have finding, but all the people you meet will "lose it" occasionally. There are two things to consider here, one is how to predict the crashes and second how to minimize the impact and or frequency. The best methodology I know to predict a crash is to keep good paperwork. Both you and your player should keep training records and diaries. Keep charts of the training, measure the amount, intensity, duration. Keep records also of the emotional and physical responses to the training. Was it a "good session", did you over do it, do you feel sick? Are you feeling positive or negative? Again, both you AND your player need to keep diaries/records. Comparing the two will highlight areas where you and your player see things differently. From these records you will hopefully be able to "see" patterns, like my 4 weekly crashes. Or maybe it's just after a competition (or just before)? Maybe it is a diet thing? Maybe it was a bad Randori? ...preventing and coping with crashes. This to be frank is the hard bit and very much where your abilities / talents / skills / magic as a coach will be needed. It'll take a good knowledge of your player and of the causes of the crashes. Then you'll need to decide upon, what they call in sport psychology, "interventions". By that all they really mean "doing stuff" to make things better. So, if you know that for example your players motivation crashes just before a competition, you can address this in a number of ways. For example, the motivation might be crashing as they get nervous about losing. So maybe do some mental rehearsal work to lower their anxiety levels. This might prevent the crash. Alternatively, such as my case, you could consider revising your periodization plan. In my case, I am "trying" to schedule the transition phases between cycles for the week I expect a crash. So changing things up in that week when I expect to crash. In summary, good record keeping and review will help you detect the crashes in advance. Then if you can see them coming, you can implement strategies to prevent or minimize the crashes. What would be the impact of high tech Judogi in Judo? World Judo Masters 2008 Training - Week 29/48. World Judo Masters 2008 Training - Week 28/48. I love this Tee, wonder if I can get it here? World Judo Masters 2008 Training - Week ?/48.